Monday 13th April We’ve got the Northern Ireland international team with us for the next three days along with tour guide Martin Ritchie from Tay salmon flies so we can’t fail. The river was up about 6” from Saturday but still nice and clean although the temperature has dropped from 49-50 Degs to 44 Degs but a wee thing like that wasn’t going to put these lads off, so after a refreshing dram so set themselves up it was off round the beat. It must be a wee bit daunting when you’re new to a beat some 2 miles in length, so getting everyone with the right line for their respective area took a while along with the choice of just the right fly (black and yellow) every time until it warms up. Anyway we thrashed our way round the beat from the Temple to the Bags but not so much as a pull. Lunch as ever was a convivial affair I then got Paul Wilson into the Cauld boat, we saw a fish on the first run down but no action, back to the top a large Sunray on and we were into a Seatrout on the first cast a 6 1/2lbs licer which cart wheeled round the Cauld. Fished the Slap, waded the tail, saw another fish but no more action. A couple of other fish were seen down the beat giving us hope for tomorrow but the only action was a good rise of trout to the March Browns which were hatching slowly all afternoon rather than at lunchtime due to the water temp drop I should thing. It was this week last year I saw the first clutch of Mallard ducklings, no sign this year so far. 2’0” on the gauge this morning and falling but rain in the far west tomorrow and I hope it stays there. Tuesday 14th April The day began with some serious hangovers of the biblical kind which hampered the fishing effort some this morning. This afternoon the wind had really picked up and the only place a fly could be seriously fished was the far side of the Cauld. Martin was in the Cauld with Paul and they did see some nice fish but couldn’t get a pull from them, the other lads had retired to the hut by mid afternoon and were sorting the world out. March Browns were hatching well this afternoon but the Trout had to be quick to catch them as the wind had them airborne in seconds, I managed one which should have been 2lbs but was still a bit thin. Bob Jewels from South Wark tells me that he has seen the Osprey today, and we saw a pair of Sandpipers in the Cauld this morning. There is to be a bit less wind tomorrow so we should get a better chance at them. There were 3 caught at Lennel today and a couple more below that so fresh fish are coming in. It’ll be better tomorrow. 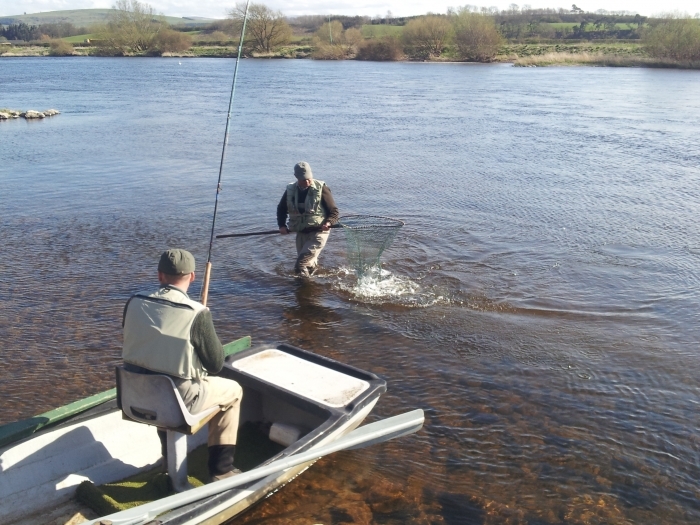 Wednesday 15th April A warmer day but this morning the wind picked up again making the bottom end of the beat a bit difficult with the wind blowing upstream, on the Cauld however the wind was fine as long as you were in the boat casting from the far side. 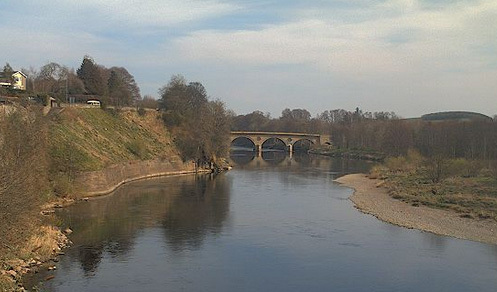 Only 3 rods turned up this morning as Girvan had eaten a dodgy pie or something like that, but the 3 that were here fished all the likely spots but no action was had, looking at the websites tonight I see there are only 3 fish reported off the whole river! I did hear about another one from a beat that doesn’t report but that’s still just 3. We saw 2 fish in the Slap and a couple in Learmouth stream so there are some about we just can’t get a pull from them. The Osprey was over the Cauld yesterday morning Paul tells me and a few more Swallows turned up. There are still March Browns coming down which all the wildlife on the river is making use of them, is a dangerous life being a March Brown. 1’6” and 46 degs today so conditions are perfect for the Lees at this time of year, some of the pools are a wee bit slow but it means you can cover all the water and it should slow the fish down, then you hear that Upper Floors had 5, 4 of them long tailed liced, so what we really need is resident fish to act as decoys. That’s team Ireland away home; I just hope the wind didn’t put them off. It’ll be better tomorrow. 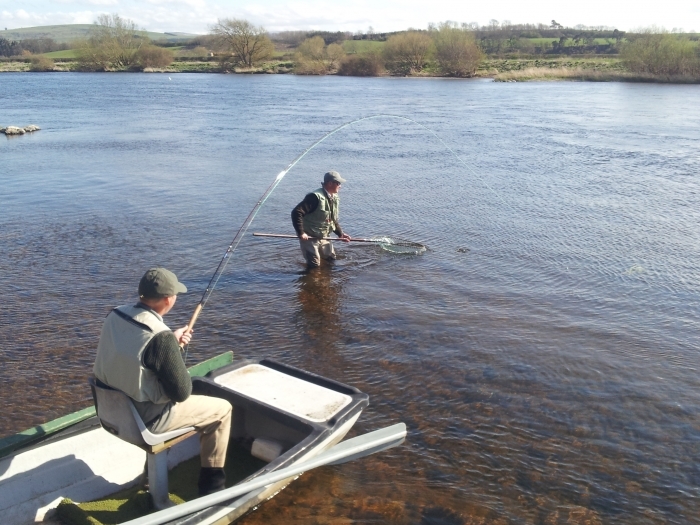 Thursday 16th April Jim Fleming and party here for the day and looking to make up for the blank last time, I have to say it was lucky that John Low was with them as he listened to advice put on a Sunray and landed a fish! A liced 7lber from the Cauld this afternoon, he also lost one in the Middle Stream this morning, Jim managed a pull in Cornhill bend Murray had a Brown Trout and scared a Salmon in the Slap, I know he scared it as I’d walked along the Cauld and was watching the fish as the Sunray came towards it and it didn’t like it. We saw a number of fish in the Slap around 11.00am but by 12.00 noon it was all quiet. Late afternoon the tail of the Cauld had a good few fish splashing about and they looked like they had settled in, I hope so as it gives us something to go at tomorrow. On the sadder side was the sight of a Swan with a Flying “C” stuck in its wing and the swan trying to get it out sometimes getting its beak stuck to the other hook, It ended up in the Bags on the other side and as I don’t have a boat down there at the moment I couldn’t reach it, there is a boat on the other side but they were too busy trying to catch a salmon. So to all you fishermen who are still spinning in this low water DON’T CAST ANYWHERE NEAR THE SWANS! It only takes a minute for them to go by so just let them, when the general public see something like that it’s all of us that get the blame. I’ll keep you posted on the swan progress. 1’6” and 46 degs squeaky clean frosty start followed but warm sun and more of the same forecast, that’ll do me! Friday 17th April Today is a very rare day, I didn’t make it to work today, I was up half the night with my nose running like a drain, sore throat and stinging eyes so it was a day in bed and on the settee. 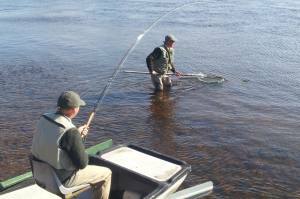 Paul text me to say one of the rods had lost a fish in the Bags and the fish in the Cauld had buggered off elsewhere. It was a nice sunny calm day as well the kind that I love to be on the river, we’ll see what I’m like tomorrow morning. Saturday 18th April I’m still feeling awful (it’s all right I don’t need your sympathy) It’s a real bugger laid up in the house on a day like this, sun cracking the paving stones and I’m full of the cold. No reports from Paul so nothing caught I presume. 8 fish reported on the websites today, no rain forecast for the week ahead so tactics will have to change, I have a cunning plan though! Photos this week are of Paul netting John Low’s fish from the Cauld.